This page provides information about some of the structures for the botox courses. We will also review the level of hands on botox injection training provided to the delegates. The toxin will be injected into specific facial muscles. This is known as an intra muscular injection. Some indications will require a more superficial injection which is known as an intra dermal injection. There are a lot of companies offering courses with botox and alternative brands of neurotoxins. Who can train and practice botox injections? Medical professionals already have the required skills to provide injectable treatments. A doctor, dental professional, nurse or pharmacist prescriber are currently accepted by major insurance companies and pharmacies as suitable practitioners with BOTOX. Although some training companies and insurance providers will train and insure people with no medical background. This is due to no direct regulations related to botox cosmetic treatments and their use. However BOTOX is a prescription only medicine and must be sourced and administered following strict guidelines(MRHA). Some of the courses offer little or no hands on injection time with botox. A clinician will need to reach a good level of confidence and this type of course will not produce confident practitioners. Trainees need to assess and inject patients to become confident. The student must also be supervised by a competent trainer who is working with in a recognised botox training company. When searching “botox courses” on the internet you may find it very confusing. The companies will have different entry criteria, duration and course content. Some will provide hands on injection with patients, others only may use prosthetic dummies or offer just the theory. A recognised and established botox training company is most likely to provide the resources and level of training required. 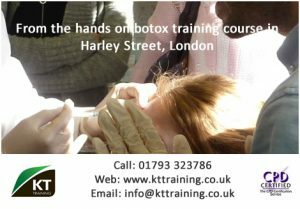 KT Training provide hands on botox injection training. These sessions enable the clinician to assess and treat multiple patients during the course. If you are new to aesthetic medicine the foundation course is ideal. 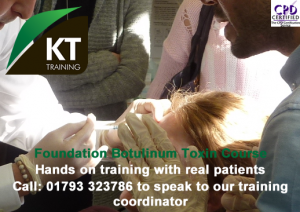 If you have received botox training from another course provider and do not feel confident with the injection technique contact info@kttraining.co.uk for information about foundation training and hands on botox injection workshops.